Warping may naturally result from physics of welding, but that doesn’t mean we have to accept imperfect finished products. With enough foresight, creativity, and welding expertise it’s possible to either adequately straighten machined parts after they’ve warped, or prevent them from warping altogether. At Allis Roller, we leverage a variety of tools and tactics for overcoming warping in the high tolerance machined parts we produce. Warping impacts some machined parts more than others, and ones made from sheet steel are particularly vulnerable to this phenomenon. During the welding process, materials are subject to intense heat followed by cooling, which can warp the overall part beyond the necessary specifications. Welders can address this problem from the outset by predicting how the part will warp and strategizing accordingly. Sometimes, with adequate preparation we can entirely avoid the need to straighten a machined part during the final stage of finishing. At Allis Roller, our team of highly experienced welders and engineers have a system that addresses warp as part of the initial product and process design. First, we will analyze the function of the part, then discuss its operation with the customer, and finally, predict how the material could warp. Once we have a solid understanding of how a welding process will cause a machined part to warp, our engineers can design custom welding fixtures in a manner that compensates for the warp of the welded components. 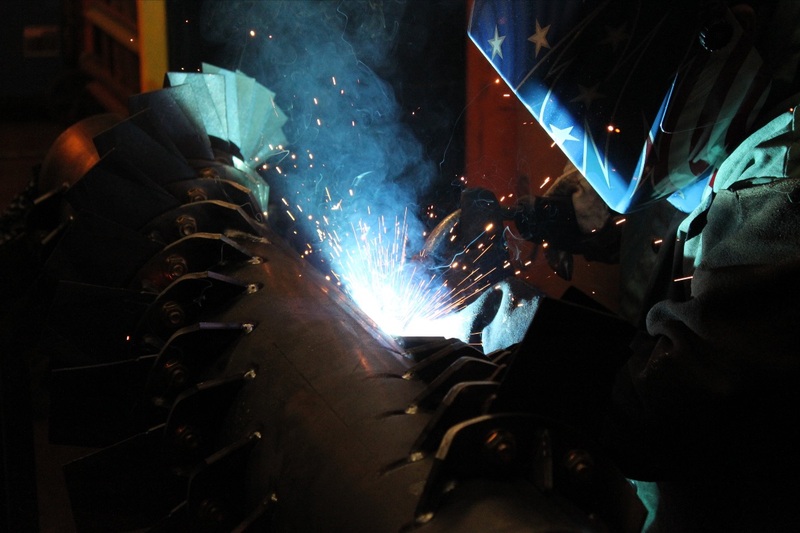 Leveraging the high level of experience and expertise of our welders, our team troubleshoots around problems, limiting the amount of final straightening required to maintain strict specifications. During this same preliminary design stage, we can also assess whether or not specific warping prevention processes and treatments can be applied. Allis Roller utilizes one such proprietary method for preventing warp called a Heat Treat Stress Relieve operation. Many of the parts we produce at Allis Roller are roughly machined to a specified shape before being subjected to this process, allowing our machinists to finalize the part to its finished dimensions without fear of warping. Preventing the need to straighten machined parts is a very delicate procedure, and requires a certain amount of welding skill to complete. In addition to our engineering and troubleshooting capabilities, this proprietary methods sets Allis Roller apart in the level of precision our customers can expect from us. When the right preliminary steps have been taken, a machinist can then effectively address the warping of a machined part post-weld using a few different straightening tools and tactics. Machinists typically straighten machined parts using methods that apply force to a component in a manner that re-aligns the warped surfaces of the part to its original or intended specifications. This finishing step is essential when machining parts used for high tolerance applications. One of the ways we straighten machined parts at Allis Roller is by using hydraulic straightening tools that reduce any distortion of the part’s material. Hydraulic straightening tools like ours are fairly common in most machining operations. However, our expert welders can also use exceptionally effective heat straightening methods to correct warping, which is unfortunately a lost art in the precision parts machining industry. By applying heat from a torch to the opposite side of the warpage, a welder can draw the part back to its original shape or straightness. The process requires a high level of skill, because the welder has to know where to apply the heat, as well as how much. When done poorly, heat straightening can result in damaged or weakened parts that won’t measure up to customer needs and expectations. At the end of the day, no specific straightening method will salvage a part if the welder doesn’t possess the knowhow needed to adequately plan their process. Accounting for warp is complicated, and the key to producing a precisely machined part every time is strategy. The more experience and expertise a welder has, the more effective they will be at finding ways to achieve the intended result despite any difficulties. For more information about the straightening of machined parts, or how Allis Roller produces complex machined parts according to high tolerance specifications, connect with one of our team members via the Contact page.